Metastasis is the process whereby a tumour that grows in one organ breaks away from it and travels to another organ and colonises it. In the colonisation process it needs to create new blood vessels through which the cancer cells obtain the nutrients and oxygen they need to grow. This blood vessel formation process is called angiogenesis and is carried out by the endothelial cells. 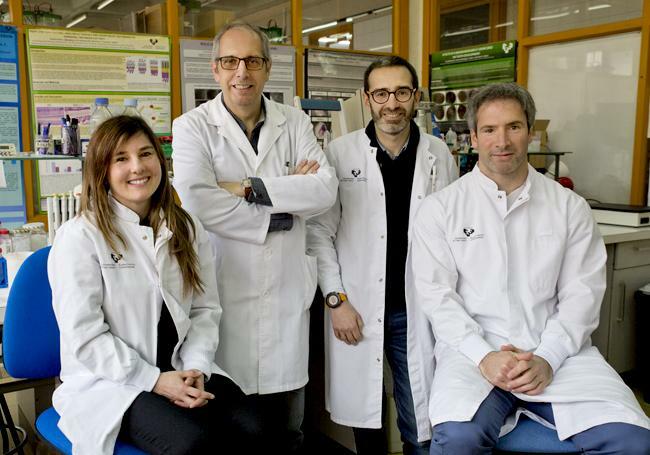 "Unlike normal endothelial cells and due to the signals that reach them from the tumour cells, the cells that supply the tumours have increased growth and tend to move towards the metastatic mass to help it grow," said Iker Badiola, member of the Signaling Lab research group in the Department of Cell Biology and Histology of the UPV/EHU's Faculty of Medicine and Pharmacy. In order to find out what is actually causing this change in the endothelial cells, the UPV/EHU's Signaling Lab Research Group and the Department of Pharmacology, Pharmacy and Pharmaceutical Technology of the University of Santiago de Compostela, in collaboration with other groups of researchers, embarked on research using mice. The ultimate aim was, as Badiola pointed out, "to slow down the metastatic process by impacting on angiogenesis in the event of bringing about the restoration of the endothelial cells". In the research they induced liver metastasis in mice by using colon cancer cells and from the mass they extracted endothelial cells. They then compared these endothelial cells with other healthy ones. The comparison made covered two aspects: on a protein level, in which they saw which proteins appeared and which did not in each cell type, and to what degree they did so, and in the same way with respect to the degree of micro-RNA. Micro-RNA consists of small elements which for some time were not thought to perform any function but which are now known to play a role in protein regulation. Using Biocomputing tools they screened and selected the proteins and relevant micro-RNA elements, and "in the final step in this selection process we ended up with a specific micro-RNA: miR-20a. This is an element that appears in healthy endothelial cells, but disappears in those that are in contact with the tumour. We saw that due to the disappearance of the miR-20a in the endothelial cells, a set of proteins appeared and that was when their behaviour began to change and they started to grow and move around," explained Badiola. They then started experiments to see whether including the miR-20a element would restore the behaviour of the endothelial cells that supply the tumours. To do this, they developed nanoparticles "designed to target the endothelial cells in the liver and loaded with miR-20a. We administered them to mice in which we had previously induced metastasis to find out the effect. The pathological analysis revealed that, in the cases treated, far fewer new blood vessels had formed inside the tumours. We also confirmed that the number and size of the metastatic masses had fallen by 80%", he said. Badiola positively rates being able to reduce metastasis size by 80%, but he makes it clear that "if it is ever used as a treatment, it will be a complementary treatment. You can't ignore the fact that the metastasis goes on growing 20% and, what is more, at no time are the tumour cells destroyed nor are they attacked directly. The strategy of tackling the metastasis that we have achieved involves limiting the supply of nutrients and oxygen; in other words, we restrict the help". This work has been published in the International Journal of Cancer and the nanoparticles are in the process of being patented by the UPV/EHU and the University of Santiago de Compostela (USC). Although the work was led by researchers at these two universities (Iker Badiola's group at the UPV/EHU conducted the study into cell behaviour, and Alejandro Sánchez's group at the USC designed the nanoparticles), they also had the collaboration of other centres such as the Biodonostia Institute, the University of Düsseldorf, the University of Bordeaux and the UPV/EHU's SGIKER service.